So here's the scoop. If you've been around here for the past few months, you'll know that Bookworm1 and I have become huge fans of Tumtum & Nutmeg, which was first recommended to us by Stephanie at Simple Things. I have mentioned these mice a time or two. They are adorable. They are cute. They can almost make you love the idea of having mice living in your home. (Almost, but perhaps not quite.) We love these stories. 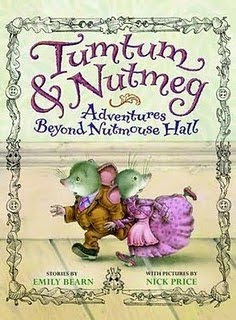 Since I read it, I've been harping about it at every available opportunity and so I asked Little, Brown Books for Young Readers if they'd be interested in hosting a giveaway with Tumtum & Nutmeg: Adventures Beyond Nutmouse Hall which they were very agreeable to do. Therefore I am delighted to announce that I have THREE copies of Tumtum & Nutmeg: Adventures Beyond Nutmouse Hall to give away to three of you. You'll definitely want to grab a copy of this book, even if you don't win, and read it soon. Why? Because the NEXT Tumtum & Nutmeg book is due to be released at the end of September! 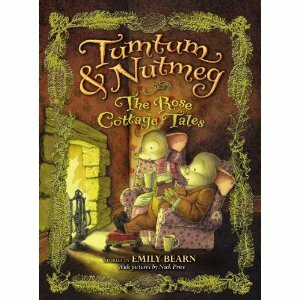 Ladies and Gents, get ready for Tumtum & Nutmeg: The Rose Cottage Tales ! I want to be right up front in telling you all that I declined an ARC of the book because I am most interested in purchasing the hardback copy of The Rose Cottage Tales to match my hardback copy of the first set of Tumtum & Nutmeg tales (also purchased.) I like these little guys that much and I know our family will be enjoying them for years to come. It is my delight to support this book! Enjoy, courtesy of Little, Brown for Young Readers! Don't forget to spread the word! I kinda have a "no child left behind" policy (heh heh) regarding Tumtum & Nutmeg - already having gifted it a few times over to mothers of new babies. Have I mentioned these stories are just fun? Ok, just checking . . . I don't know if I ever told you that I'm reading The Rose Cottage Tales (ARC) right now! These mice are adorable! I would love to have Rose Cottage Tales, too! I blogged earlier this week! Well now. I've already mentioned our love for Tumtum and Nutmeg. Our copy was from the library so we would be thrilled to own one of their books! oh fun! i'm a follower and that's how I read about your giveaway. I'm excited to win! lol. I have a giveaway going on right now too if you want to come see! we love, love, love Tumtum & Nutmeg but we don't own them. Thank you for your blog! Our family loves Tumtum and Nutmeg. We just got our own copy to celebrate dd6 being in 1st grade. If we win this one we know just the perfect little neighbor girl who would love it. Hey, here's my comment for entry in the giveaway! I will look into these books because I'm looking for good read-alouds for my 4 year old. These may be aimed for an older audience, but everyone says they grow so fast! I'm laughing at the "no child left behind" policy. I tend to feel guilty entering my name for blog give-aways for children's books--there are so many other deserving souls out there who have children to enjoy such things! And then there are the fiction give-aways that I choose not to enter because I generally only read fiction once and can get it from the library anyway. Please enter me for the giveaway! My 4yo would love this. I absolutely love the covers. My grandson sure would love to read this. Please enter me, thanks. Bethanie Hansen introduced me to your blog, and I love it! Would be terrific to have a copy of this book to have when my niece comes to stay. :) Keep up the great work! We had mice in our house this week, running through our bedroom, no less. I was happy when the trap went SNAP (twice), and then tried not to think about it as I read Stuart Little to my kids the next day! With all the good recommendations, this has been on my "purchase when there's a good sale" list for quite a while! I would love to win a copy! Hey! Thanks for the linky love! :-) Since we loved the book but don't own it, sign me up, too! Ooooh! I want, I want! :) Thanks for the chance to win these. I always want to win your giveaways! You have such great books to give away! I am so pleased to have come across your blog. The recommendations are outstanding. We now hav e a list of books that we are going to try and locate at our local library so that we can read some of the ones I was not aware of. I really REALLY have been wanting to read this. Pick me, pick me. We're always looking for new to us, good children's books. My kids would enjoy these books! I think my son would love this book. What a cute book! I would love to win a copy! Please enter me. This is a great site. I love those books. I love the look of this book. The art is charming. Oh, what an adorable sounding book! Crossing my fingers!! What a terrific prize! Please count me in. This looks like a sweet book. I would love to win this for my daughter. Thanks for the chance. Oh Tumtum & Nutmeg sound precious. Please enter me into your giveaway. This book sounds like it would be great for my youngest grandson. Thank you for the giveaway! It looks so cute. I might have to break down and buy this if I don't win it. I know my daughter would love it if I read this book aloud to her. This book looks extremely cute, and I think my students (a bit older) would enjoy it as well.